Admiral Pittenger served with distinction in a 37-year career with the United States Navy that culminated in his appointment as Oceanographer of the Navy. In that position, he was a strong supporter of science and engineering education for naval officers. He was an especially strong advocate for several officers who earned degrees in the Massachusetts Institute of Technology and WHOI Joint Program in Oceanography. 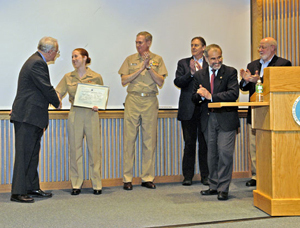 After his retirement from the Navy, Admiral Pittenger joined WHOI in 1990 and continued to promote graduate education of naval officers in ocean sciences and engineering. As Oceanographer of the Navy and throughout his years at WHOI, Admiral Pittenger played a key role in ensuring access to modern, first-class research vessels and vehicles in the U.S. academic fleet and at WHOI for present and future generations of graduate students and their advisors. This award was established in 2004.